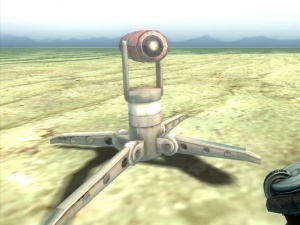 Engineers can construct a single camera or radar dish. The camera will reveal enemy infantry on the mini-map and the radar dish will reveal enemy vehicles and structures. Also, the enemy units will have an orange diamond drawn around them on your HUD if they are in the Surveillance Equipment area of effect. You will be able to see it even from behind terrain and obstacles. Tip: It is possible to destroy Surveillance Equipment using small arms fire -- which includes bullets and melee attacks. Note: Individual Engineers up to the 4th promotion may only have one active surveillance structure at any given time. After reaching Staff Sergeant, they can have up to two of these structures active simultaneously. Note: Brenodi Surveillance have the same models as Northern Faction Surveillance, but they have a dark colour. This page was last modified on 5 September 2013, at 00:45.